Dreaming of a Spring Camping Trip? Winter is the time to start planning for the epic trip of a lifetime! While most of us are sitting in front of the fireplace with hot chocolate and flipping through our phones, looking at pictures of our last camping trips of the season, some die-hards are out there in the snow, donning long johns and drowning out the hypothermia with alcohol… Huge respect to those guys! Sure, there are no bugs in winter, and fewer deer and bears and people crowding the camps… But if you, like me, want to avoid unexpected hypothermia, or simply respect your body too much to allow it to chill to the bone, you’d be better off using the colder months to better prepare for a more epic spring camping trip. Last year, we wrote about Paddling Separation Anxiety and the symptoms of longing back to paddling trips. Many of those symptoms are similar to what you’re feeling now about camping. So let’s give you a few constructive ways to prepare for your first spring camping trip. Connect with nature - When you can’t be at Hartley Bay Marina, find some ways to surround yourself with nature, whether it is by taking a stroll through your neighbourhood park, or making s’mores by the fire pit in your backyard. Sunshine provides vitamin D that chases the low emotions away. Keep your body fit and strong - That first day of paddling in spring can take its toll on your body, so be sure to keep fit throughout winter by biking (if you have fat tires – if not go buy them, you can actually bike in winter! ), hiking, visiting the gym and doing yoga throughout the winter. This will ensure that you’re not in pain after Day 1 and you can enjoy the rest of your trip to the fullest. Prepare your gear - Winter is a great time to get your gear in order. Take time to fix any holes in your tent, kayak, canoe, jacket, shoes etc. now, allowing them to settle properly during your down time. If you are like me or any outdoor adventurer at Hartley Bay Marina, you can relate to the “Oh Doh” when you forgot to fix something from last year in the first spring trip out of the docks. Buy new gear - The one good thing about winter is that there are many sales on summer gear. Take advantage of it now and go into summer with all-new gear. The excitement should keep you going. Check out good camping spots - Things can become busy when the camping season rolls around, so use this time to look for good spots. Keep your eye on the Hartley Bay Marina website for announcements so that you’re the first person to know when it’s officially spring camping season. We’re looking forward to welcoming you back for your first spring camping trip of the year! Don’t forget to get packed and be ready May 1, 2019 (weather permitting we are open). See you then! It was a relatively windy day in May. I tried to figure out a great excursion that would bypass the bad gusty spring winds coming off Georgian Bay, funnelling up The French River from the South. Usually, I would try to get out from Hartley Bay Marina to the Bustard Islands on Georgian Bay to hunker down for a few nights this time of year, but not today. Crossing the treacherous Georgian Bay waves to the Bustard Island’s campsites (approximately four kilometres) would certainly test my solo kayaking abilities on this gusty day. 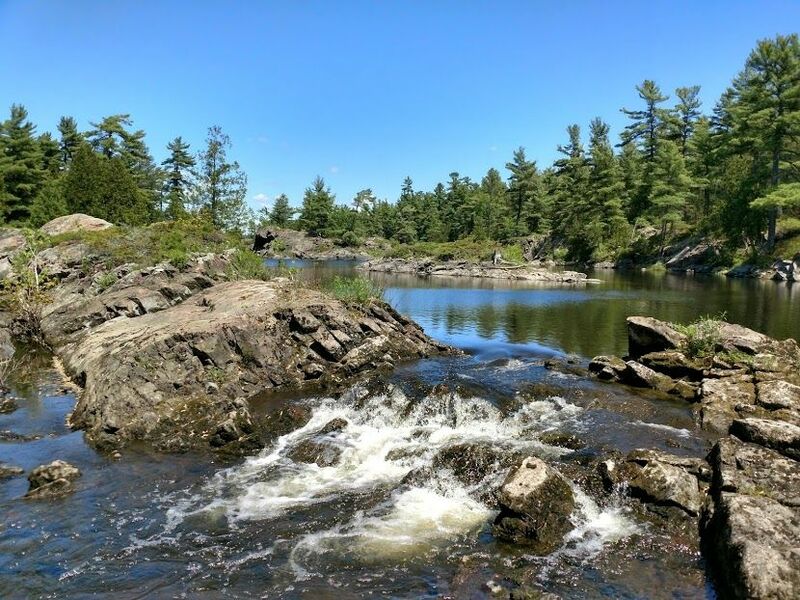 Instead, my goal was to simply connect with nature and to enrich my experience via exploration of The French River. I wanted to explore a spot that keeps away high maintenance travellers, and I was tipped off about a great route by the owner of Hartley Bay Marina, James Palmer. Upon learning that I could travel down a “lazy river” in late spring with relatively few small rapids and one very small old portage called the Old Voyageurs Channel on the Lower French River, I quickly started planning an exciting three-day excursion from Hartley Bay Marina to the Western Channel of the Lower French River to Georgian Bay, then up through Bass Lake, with my extraction (water taxi) back to Hartley Bay Marina. This would be a real-world test to see if I could navigate back to my extraction point via Hartley Bay Marina Water Taxi without getting lost. I was excited to explore a back door entrance (James Hartley told me his best kept secrets of these waters!) to an amazing place that would ultimately reach Georgian Bay. My mission was to mirror the path that Voyageurs took not only physically, but also to try to understand and examine mentally (at least by clues in nature) how people 100 years ago could bypass some treacherous conditions such as rain, wind, bugs, hunger and more. Did I know suffering? Heck, no! But I do know enough, having been lost and cold and afraid while camping. I know how, when your instinct kicks into survival mode, amazing things can happen. I’ve learned to make educated guesses, and proceed by instinct. Clues in nature can guide those who choose to listen to what Creator has to offer. Knowing water does not change its dynamics – that was the only constant I had during this Old Voyageurs journey. Over a hundred years ago, the French and possibly a few indigenous travellers would have shared these same waters, but in much worse and variable conditions. In the real world we don’t really have to use our instincts for many situations outside of our cozy lifestyles. Learning to use your true instincts is a real-world physical and mental test. Again, what gives me focus gives me strength. I kept telling myself that the Voyageurs would have been driven by instinct and focus to reach their next rendezvous posts. You really feel the travelling souls as you go South West through the Old Voyageurs Channel. It was essential for me to pack light with my kayak, so I only took a mobile phone, small food supply, and the necessary clothing items. Without the modern convenience items we have for communication, navigation, gear, and instant foods, the voyageurs had to travel with heavy luggage. As I reached approximately one quarter down the Old Voyageurs channel, past a couple of small rapids onto a lazy river, I almost felt the presence of a large canoe bypassing me - a ghost canoe of 10-12 men barrelling down the calm, relatively portage-free Voyageur Channel with tons of gear. Racing to beat sundown, possibly hunger, and possibly bad weather, every stroke would have been driven by survival. As I glanced at various clearings and features of the channel banks, I could almost imagine the spots at which the Voyageurs would have rested along the edge of the channel...The great glaciers from thousands of years ago and erosion displayed awesome Canadian Shield exposed rock, which is great for landing a canoe. The tall banks of Canadian Shield plateaus also seemed to blanket the channel from gusty winds further south west out into the Bay. What really piqued my interest were the hidden little bays and tall banks that I passed. What great spots for the Voyageurs to possibly ambush their prey or perhaps hide from being ambushed. I almost felt as though I was being watched by mystical French or ancient indigenous souls running up and down the plateaus hunting for food, fur, and shelter. I felt the relief of men finally resting and keeping an eye as their wild-caught food seared on a nearby fire. The forest and water surely had a bounty of food – if you knew where to look and had the skill to find it. However, what really stood out was the absolute calm and dead quiet – no animals, no fish jumping, and surely no rescue if I got lost or captured by a ghost ambush canoe. Could I survive out there for weeks or months on end like they did? Did the first indigenous people live along these awesome banks hundreds of years ago? As I sat on a bank to have pause for a moment and just listen and daydream, I thought this was an exciting venue from centuries ago. Maybe little settlements would have shared their secrets of fishing and trapping with the Voyageurs. Would the Voyageurs have connected with the locals during this time? It certainly felt like there was a presence of little ancient indigenous communities along these banks. If not during the Voyageurs’ time, definitely at one time - that is my belief. Who knows if what historians have written of Voyageurs’ accounts are accurate portrayals of real life on these waters? I’ve not read much about the possible suffering that might have occurred and the harsh conditions. However, I have learned that most of the French travellers back then were largely illiterate, so there is very little documentation of their travels, and their accounts might have been largely under exaggerated. As I took a gulp from my water bottle, sprayed a little Deet 30 on my skin, and checked my phone for work messages, I realized how much I take things for granted. But I pushed on, since I too had to find shelter before sundown. Finally, I felt a breeze from Georgian Bay as I approached. A few locals waved me on as I passed their cottage. One seemed surprised that I came all this way alone. It felt like a big accomplishment having found my way to Georgian Bay – and I needed reassurance from the locals that I was close. The rest was easy, out in the bounds of Georgian Bay, which felt like my old stomping grounds. I quickly found one of the many marked campsites sheltered from the bad winds on Georgian Bay and enjoyed a good rest after my accomplishment. 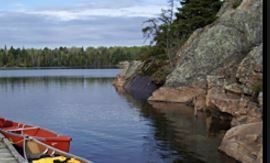 I encourage everyone to explore this invigorating back-door entrance to the Old Voyageurs Channel and let the paddling experience broaden your perspective on one of Canada’s most important Historical Routes. This gave me focus and strength on this trip. Let's look what you'll find when you take a trip into the wild outdoors. Feeling sad? You might have paddling separation anxiety! Paddling Separation Anxiety (PSA) is a serious psychiatric condition that affects many paddlers. It can be contracted anywhere, but after they've been to Hartley Bay Marina, they are guaranteed to be afflicted during winter. The condition is acute and curable only by regular paddling trips to Hartley Bay Marina. 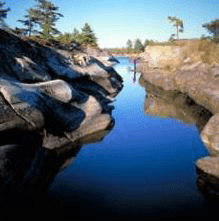 Few things beat paddling around the French River with its magnificent scenery and it is a relaxing experience unlike any - provided everyone follows the unwritten river etiquette rules everyone is happy on our crowded waterways. As with everything in life, a little bit of respect goes a long way to keeping the peace and ensuring a smooth flow of traffic. For the safety and enjoyment of everyone using the river, it is important to keep in mind courtesy and guidelines outlined on this page. Few things rejuvenate body, mind, and soul quite like French River kayaking... 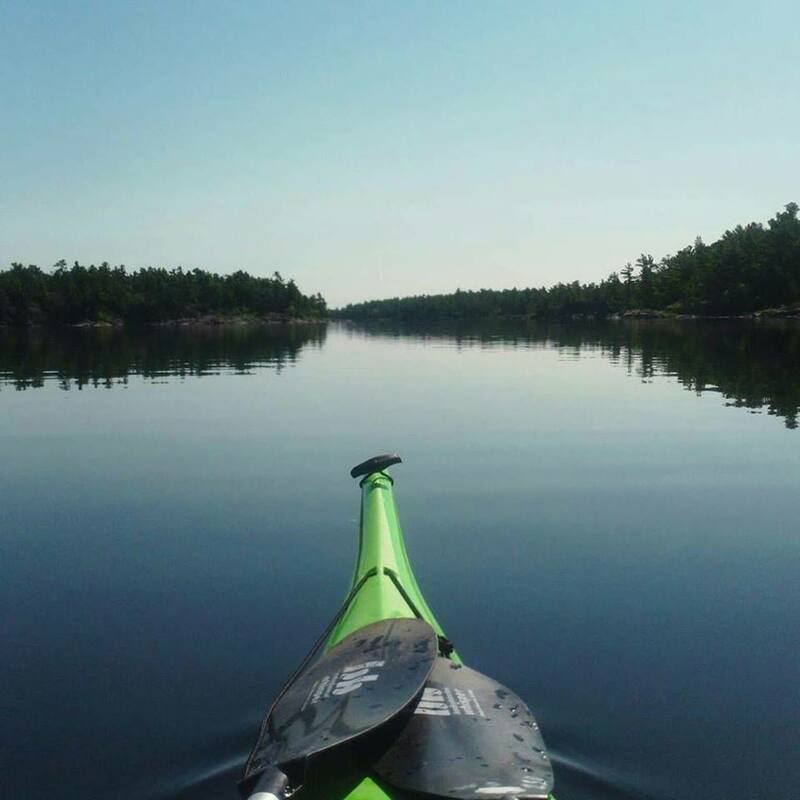 It provides the perfect opportunity to the open waters of this kayaker's paradise, which leads to Georgian Bay with its easily navigable waters. With very little vegetation and soil along the coastline, paddlers get to enjoy the spectacular views or pristine blue waters, gnarled trees, windswept islands and the thousands of small granite islands. More experienced paddlers steer out towards the less sheltered channels and open crossings leading to open bays and distant islands. 2017 Marks Canada's 150th anniversary of Confederation - promoted as Canada 150. What a long way we have come! 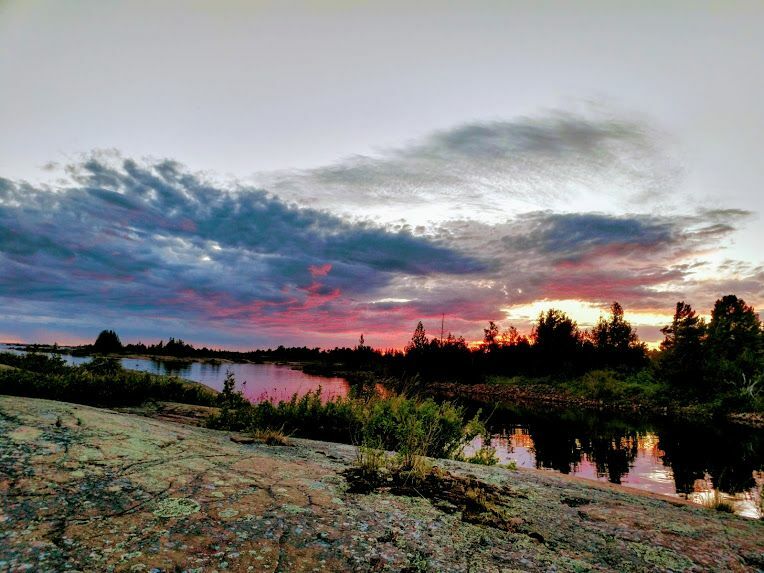 Parents across Canada are looking for ways to tear their children away from the screens and encourage them to engage in real life and there's no better way to do it than taking your kids camping on the French River via Hartley Bay Marina. I love nature. I just can’t get enough. While many women would not imagine heading into the wild without a man, I sometimes just NEED to get out and I usually can’t find anyone that can go when I can go. But also I’ve observed that we are stuck in a culture where women are working hard, and often feel unable to do stuff on our own.